Unroll 2 cans (8 oz each) Pillsbury™ refrigerated crescent dinner rolls onto work surface, leaving 1 square with 2 triangles rolled up tight. Set roll aside for later. 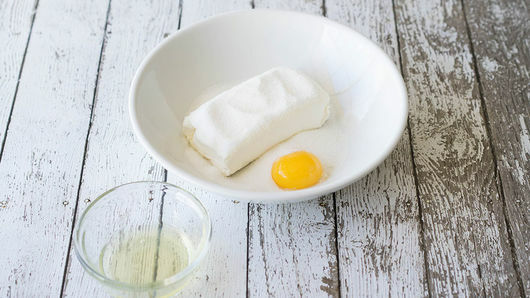 In medium bowl, beat 1 package (8 oz) cream cheese, softened, 1/3 cup sugar and 1 egg yolk until smooth and creamy. Place egg white in separate small bowl; beat with whisk until slightly frothy. 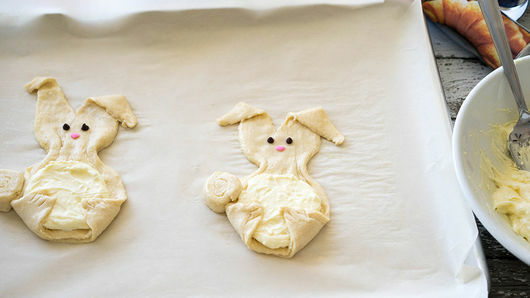 To make 1 bunny, separate 1 square of dough into 2 triangles. On cookie sheet, arrange triangles on top of each other with short sides together and long points at top opposite each other. Fold top points over slightly to make bunny ears. 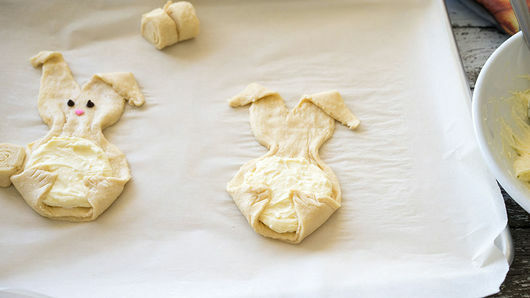 Gently pinch middle sides of dough inward to make neck of bunny. 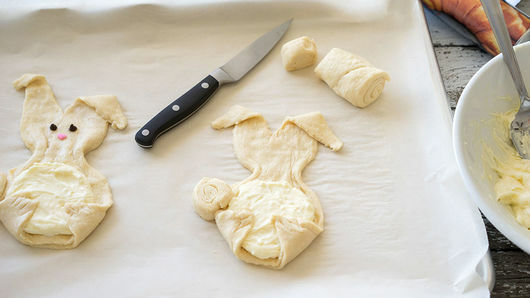 Spread about 1 1/2 tablespoons cream cheese mixture just below neck in small circle to look like bunny’s fluffy tummy. 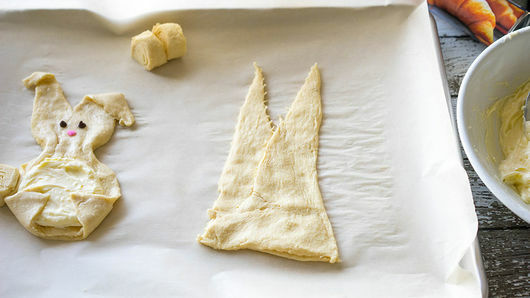 Pull bottom corners of dough triangles up over cream cheese mixture to resemble feet. Cut roll of dough into 7 slices. Gently pinch and press 1 slice into side of bunny’s tummy to resemble a fluffy tail. 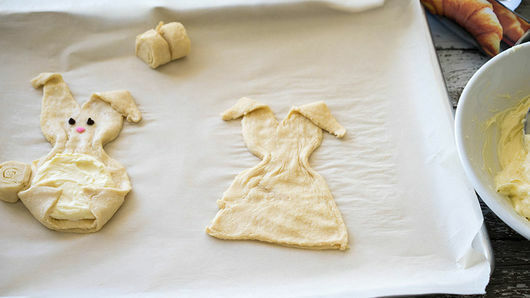 Lightly brush dough with beaten egg white. Arrange 2 miniature semisweet chocolate chips for eyes and 1 pink heart-shaped candy sprinkle for nose. Repeat to make 6 more bunnies. 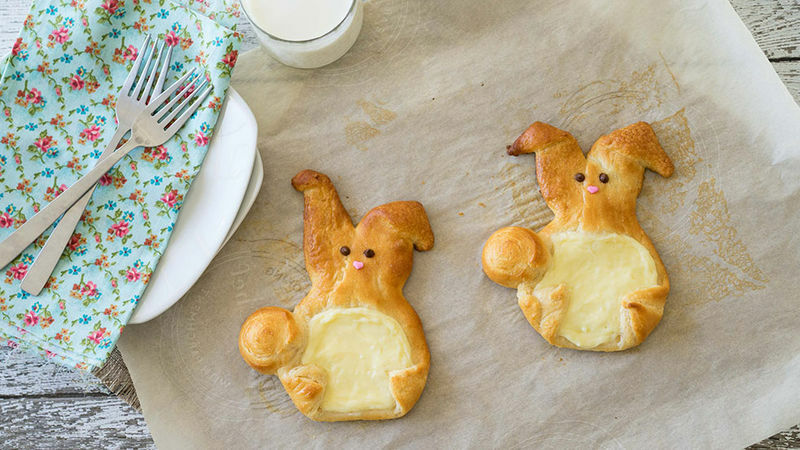 To sweeten these up a little more, try whipping up a quick icing to drizzle on top: Whisk together 1/2 cup of powdered sugar with 1 tablespoon of milk, and then drizzle over the top of the baked bunnies. 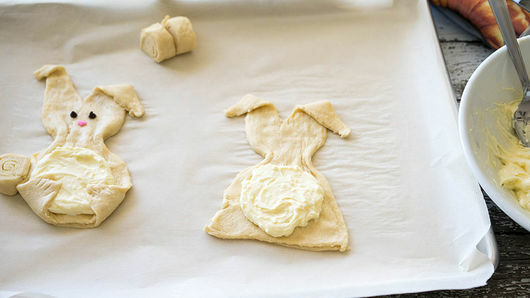 Try adding a small dollop of raspberry preserves to the top of each before baking for a fruity twist!